Who doesn’t love fall? The temperatures aren’t too warm or too cool, and nature might even be its prettiest during September and October. Fall colors can make us feel warm and fuzzy inside –– so much that we want to drink a Pumpkin Spice Latte or eat a slice of warm apple pie. From deep corals to rusty reds and mocha browns, the hues that we associate with autumn can inspire the palette for any room. Here are five bedrooms that feel like fall. 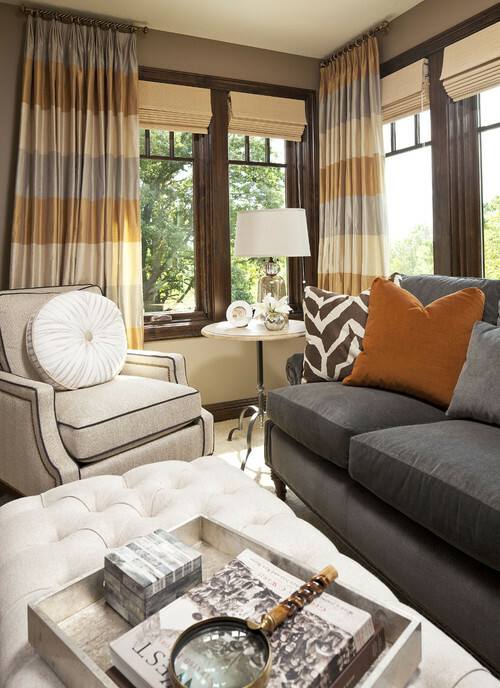 Warm grays, beiges, golds, and a hint of orange in a master bedroom seating area give us a glimpse of fall. The cozy spot looks perfect to curl up with a good book or watch the leaves fall outside those big windows. For some reason, the color eggplant alludes to the fall season. 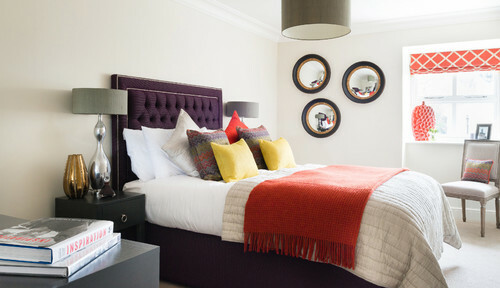 The rich color works well on the tufted headboard, and orange with purple is an unexpected combination. The accent pillows balance the two colors. Scottsdale might not get the same fall as the Northeastern US, but it does get seasons. Regardless of the amount of leaf-peeping available in this Arizona town, this bedroom sure feels like autumn. 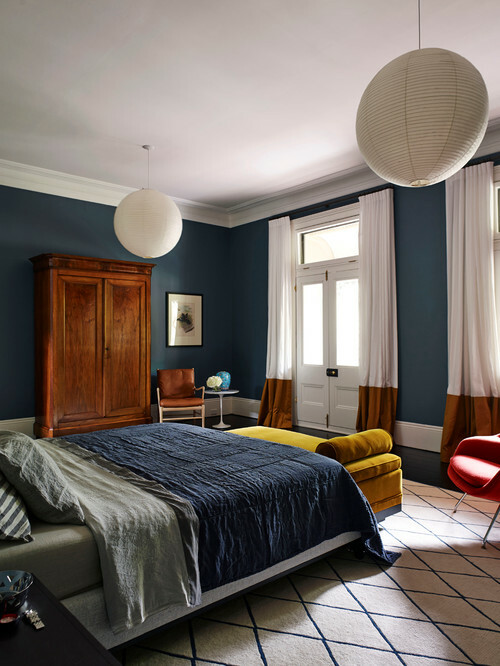 Vivid masculine colors come together nicely in this modern Australia bedroom. The simple design allows the architecture to shine. The paper pendant fixtures add some fun to the space. This Carmel Valley retreat boasts a Mediterranean flavor with its exposed wood beams, Venetian plaster walls, and the balcony and its metal railing. 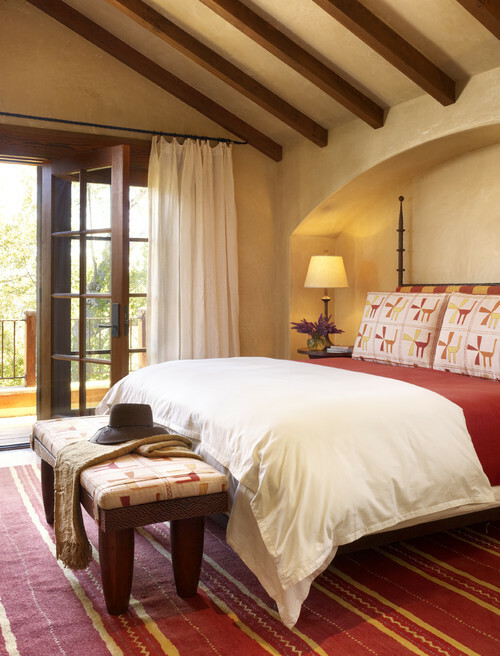 The subtle red and yellow scheme makes the bedroom feel homey and inviting. In the late 1970s and early 1980s, Disney went in a darker direction than what we have come to recognize as Disney. From Escape to Witch Mountain to The Watcher in the Woods, Disney covered the weird and the creepy with a particular lo-fi flair. 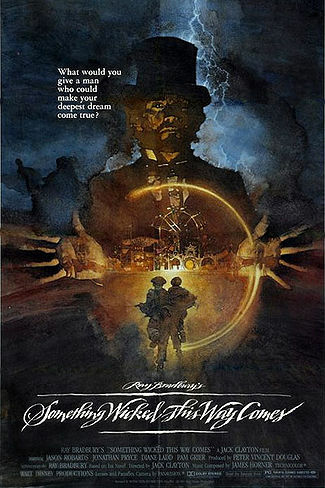 My favorite of these darker Disney days was always the adaptation of Ray Bradbury’s creepy Halloween story, Something Wicked This Way Comes. Disney even got Bradbury to write the screenplay. The movie tells the story of two thirteen-year-old boys, Jim Nightshade and Will Halloway. In the autumn before their fourteenth year, a strange and mysterious carnival rolls into town in the dead of night. Dark’s Pandemonium Carnival is no normal carnival. It’s readily apparent that something sinister is going on there. People enter the mirror maze and don’t return. Dark’s Pandemonium Carnival feeds on the deepest desires of its attendees. Their old teacher yearns for youth. The cigar store owner dreams of riches. Mr. Dark can make their dreams come true, but at great cost. When Jim and Will sneak in after dark and see one of the carnival members turned young on an enchanted carousel, they realize that they’re already in too deep. Knowing the boys know too much, Mr. Dark sets out to find the two boys, by way of magic, treachery or whatever means necessary. Part horror story, part reflection on youth and friendship, part story of an older father trying to reconnect with his young son, the underlying story is surprisingly deep and complex. But to balance all that out, there are lots of bad special effects. My 8-year-old called the creeping green magic of the Dust Witch “Scooby-Doo effects”. He’s right. This is a creepy but not too creepy movie, a great way to kick off October, the spookiest month of all. Extra tall ceilings might be number one on your wish list, but furnishing a room with height has its challenges. Furniture can look short or almost dwarfed, and how do you treat that extra wall space or those big windows? 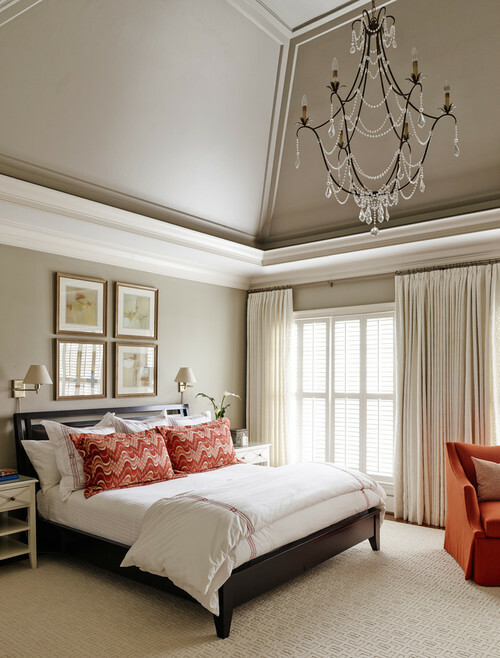 We turned to our friends at Houzz for some brilliant ideas for decorating bedrooms with lofty ceilings. This contemporary bedroom keeps things simple and straightforward, allowing the architecture to shine. The steel and stone fireplace wall with a built-in television becomes the focal point. Privacy must not be an issue because the designer chose to leave the double-height windows uncovered. 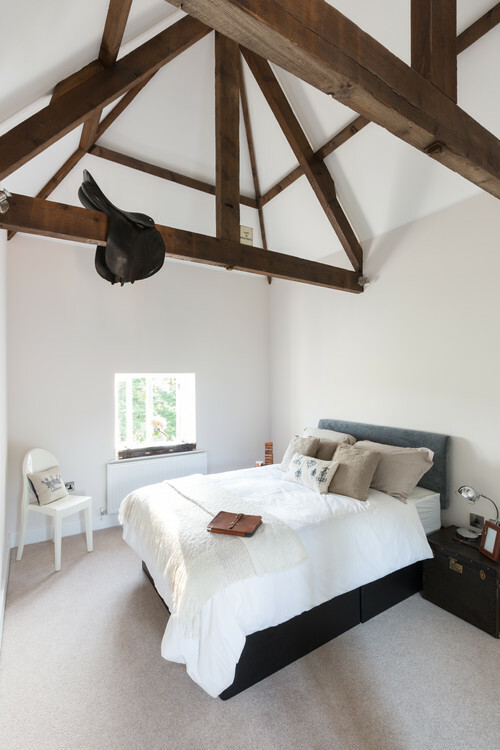 This East Midlands farmhouse bedroom celebrates the height. The room has a tower-like feel, and the designer didn’t pay much attention to the furnishings, but let the exposed wood canopy lower the ceiling height. Notice the saddle draped over the beam. 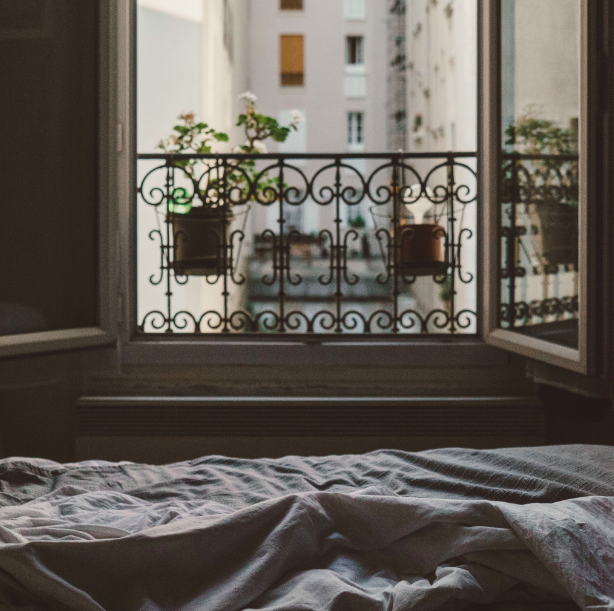 This stunning bedroom might be minimalist, but I don’t feel like it’s missing a thing. The open view of the woods acts as a natural wall covering. No windows treatments are needed. With two sets of windows –– upper and lower –– this room has drapes only on the bottom set. 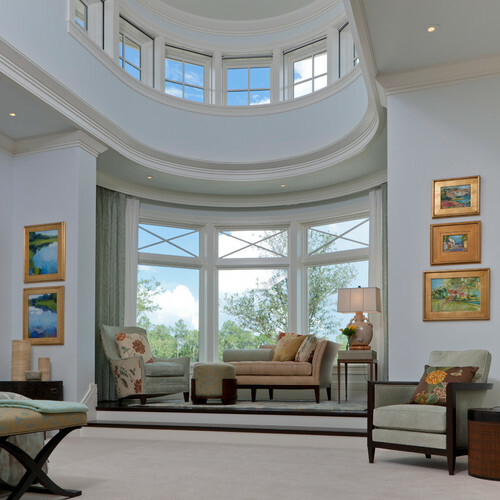 The high windows perform double duty, allowing more light and creating architectural interest. This dramatic Charlotte bedroom exudes elegance. With its vaulted ceilings and chunky moldings, the simple but neutral space gets a dose of paprika on the shams and lounge chair. The feminine chandelier feels like it’s just the right scale for this room. 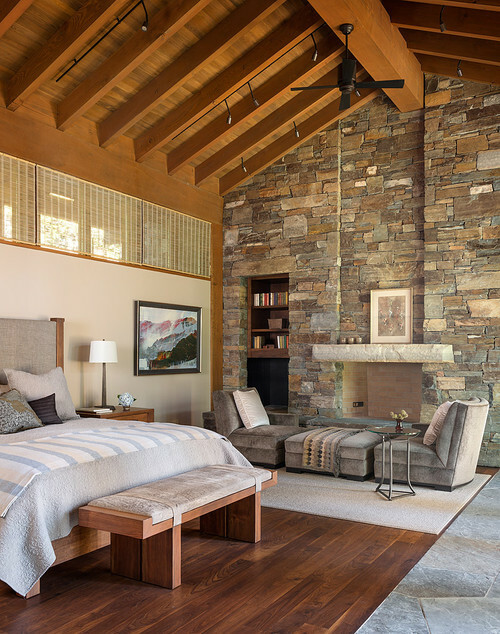 A Seattle bedroom boasts a brilliant design with a separate seating area in front of the fireplace. Notice the amount of detail and texture in this space, as well as the unique window coverings. The room is warm and cozy despite its size. 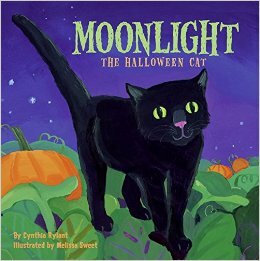 Moonlight the Halloween Cat by Cynthia Rylant. The other day I was sitting with my boy who somehow has already turned eight. We were discussing this and that and the subject came around to some of his older picture books. I went looking for one in particular, the one with a character that was the namesake for our lovably dumb semi-feral cat, Dandio. I was unable to find that book (it’s a Toot & Puddle book, if you’re wondering) but I found myself looking through a bunch of his other now neglected but still much-loved (for nostalgia) books. One of the books I brought back to the table was Moonlight the Halloween Cat. When he was two, or three, we would read this book at least once a week. Probably daily. He still has a stuffed Halloween kitty he named Moonlight. I would lie on my stomach, propped on my elbows, and he would drape himself across my back, reading over my shoulder. He’s too big to do that now! Well, we read the book and it’s just as sweet as I recall. Filled with naive art and simple text, the book tells us about Moonlight, the black cat who likes Halloween best of all. We follow Moonlight as she watches trick-or-treaters from the shadows, and sits in the laps of scarecrows and snacks on fallen pieces of candy. It’s a cute and simple book about an outsider who loves this human holiday. We get to tag along and see what Moonlight sees. Sometimes, there’s an owl! I know some of you may think it’s a little early for Halloween books. But put this one on your list if you have a little one.